Vibe B2B is a fully integrated website that provides real time reservation management and account administration functions to your partner travel agents, wholesalers and tour operators. Through the web browser of their choice your partners can check price and availability as well as book in real-time. Vibe B2B also allows reservation of add-on equipment and services available for their chosen vehicle and itinerary. Unlike other B2B web offerings, Vibe allows you to reflect the exact payment conditions you have with each individual partner. Details of what the agent is paying, what the customer must pay and any payment deadlines can be shown in detail to ensure customers are fully aware of their financial obligations and there are fewer queries from partners about invoices. Vibe B2B means less confusion and errors as they directly control the data going into Vibe. Vibe B2B also makes your product available through partners who might otherwise struggle to deal with the pricing or terms & conditions of your product range. Once a partner has been granted access to Vibe B2B, they have the ability to control access to the system for users within their own organisation. Administrative tasks such as adding/removing users and assigning privileges can be controlled by the organisation themselves rather than having to be done by your account managers. Vibe also provides the ability to maintain partner hierarchies so you can properly track performance of partners by the region, branch or department within that partner. Reduced administration workload for your sales and admin staff. Improved reporting and performance management of partner revenue generation. Making a sale can require staff and customers to understand a bewildering amount of information about vehicle types, operating hours, pickup/return restrictions, one-way restrictions, local holidays, rate plans and lots more. Vibe uses our proprietary Adaptive Catalogue that analyses all this data so that as you proceed through the booking process and provide information about your travel needs, Vibe shows you only the options that are valid. For example when booking a vehicle rental from a U.S.A. depot that is not operating on Independence Day, the drop down calendar will show that date as disabled. This also applies when booking special promotions or movement specials so customers are only presented with valid options for that particular special. Customers are not led down ‘dead-ends’ producing a more efficient and successful sales process. Customers are guided to book within the restrictions you set. Vibe provides the ability to track multiple reservations such as group bookings or an itinerary of sequential reservations. 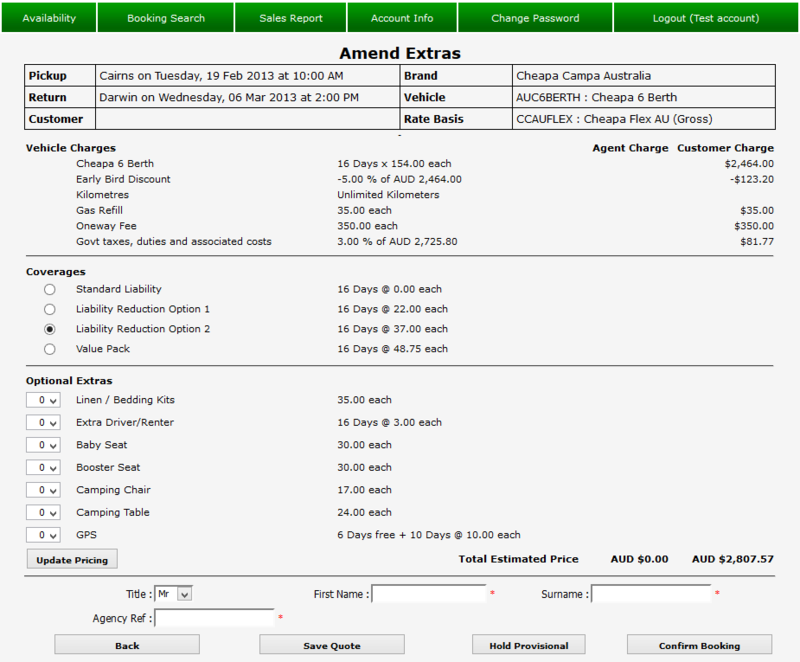 Discounts and rates can also be varied or discounted based on the overall itinerary rather than the individual rentals. Flexible and automatic pricing for multi-hires. Maintains consistency of reservations in an itinerary. Vibe can be configured to automatically offer alternative vehicles when availability is tight. This feature ensures that customers and novice reservations consultants are directed to closely matching vehicles and dates where fleet is available. Alternatives evaluated automatically can include differnet travel directions as well as suggested alterations to dates to avoid availability bottlenecks. Reservations consultants can maximise sales opportunities. Reduce the likelihood of prospective customers leaving without making a reservation. Vibe enables you to specify the payment rules you require on reservations. Vibe can cater for the simplest of rules (such as full prepayment required) right to complex structured payment rules where part payments are required by calculated deadlines (e.g. 50% by seven days prior to pickup with the balance due at pickup). Vibe enforces these payment requirements and provides alerts and reports to allow follow-up of reservations. If configured Vibe will prevent confirmation or travel commencement where payment requirements applicable to that reservation have not been met. Vibe also provides for you to authorise relevant users to be able to override such checks so you can strike the right balance between customer service and debtor management. Partner Statements produced by Vibe fully reflect the payment requirements in reporting current and overdue amounts, so staff undertaking debtor control functions are aware of the exact payment requirements for which a partner is contracted. Improved cash collection at the front counter and through accounts receivable. Greater flexibility to accommodate different payment arrangements to suit partner needs. Improved ability to tighten and loosen cash collection arrangements to support special offers. Changes to existing bookings can be previewed for evaluation purposes. Vibe ensures that the details of any price changes, transactions fees, penalties or discounts can be examined before proceeding with a modification or cancellation. Partners and customers are always aware of the financial ramifications of their changes. Present clear and simple pricing for customers. Reduce the frequency of disputes arising from transaction fees and penalties. Provisional Bookings allow your partners and reservations consultants to place short-term holds on vehicles for customers who are in the process of deciding whether they wish to proceed with a confirmed reservation. Inventory will be held for some time (typically 24 or 48 hours but configurable to your requirements) and automatically released if the booking is not confirmed within this time. This feature overcomes a number of problems that can arise with other systems where partners are forced to make 'fake' reservations and then forget to cancel them, leading to lost revenue and invoice disputes from no-shows. Partners can accommodate communication delays that sometimes occur in dealing with potential customers. Reduces the incidence of 'no-shows'. Allows partners to avoid potential cancellation fees where customers have not yet confirmed their requirements.